Hatters boss Nathan Jones has warned the club would struggle to survive in the Championship if they don’t get planning permission for a new ground at Power Court. Although currently in League One, Jones’ clear aim is to win promotion to the second tier of English football and with the squad in place, it is a definite possibility in the not too distant future. We’re moving in one direction, we want to continue that, but we want to continue that curve at a real good pace and we need the stadium to do that. However, Jones believes that should the club go up, they wouldn’t be able to cope for long, saying: “No, I don’t think it could. “People like Burton have shown that. 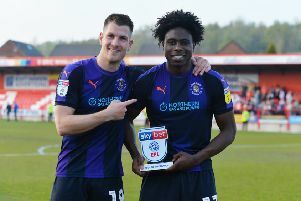 They really over achieved to stay in there for a season, but it sometimes becomes inevitable and I don’t want anything to become inevitable about Luton Town, because we’re a fantastic side. “We’re moving in one direction, we want to continue that, but we want to continue that curve at a real good pace and we need the stadium to do that. “Now this is not a money making thing, this is not a selfish thing, these are good people trying to do good for a football club which is vital for the area, for the community for everything else. Jones looked back at his former club Brighton, who are now attempting to establish themselves in the Premier League after moving from the Withdean to the Amex Stadium in July 2011. He continued: “They were financed by a fan, a very wealthy fan in terms of Mr Bloom, but he was a fan from the Withdean days. “We (Brighton) had a side similar to this side (Luton). “A great team spirit, real talented individuals, we’ve probably got more ability here than my side had there when we got promoted. “I see a lot of similarities in the way the club is going and so on, obviously they were playing in a makeshift stadium, we’re playing in our own in terms of Kenilworth Road, but the progression can be the same and you can see what happened. “Brighton needed that stadium, they needed to get into the Championship. Then they went in with that stadium, and they were able to build on that. “They were able to not just compete in the Championship, but they were at the forefront of the Championship. “That’s what the ambition has got to be because with the structure we have in place, we don’t need to throw money at everything. “What we do is we build, we build safely and then what we do is develop players. We take people forward and we do our recruitment and all our background checks, so that we don’t make mistake, we’re not throwing money at it. With no end in sight at the moment, as the council continues to take their time over the planning process, Jones added: “It’s very frustrating, because I’m not being disrespectful to anyone or anything, but this area needs that development, it desperately needs it. I’ve been around Luton and I go in, and I bet you so many people drive past Luton to go elsewhere to do shopping, to do things that they need to do and it’s so, so important. “For the area I think it’s vitally important, for the football club, if they want a successful club to be competing they have to get the stadium. Otherwise we can’t compete at that level and we won’t be able to hold on to all our real good players, if we don’t get that planning.